Tessa grew up in Edmonton, Alberta and graduated with a B.Sc. Honors in Geology from the University of Alberta in 2015. Throughout her undergraduate degree she gained a passion for the petroleum industry, and was fortunate enough to work as a summer intern for ConocoPhillips Canada's Oil Sands Subsurface team in 2014. 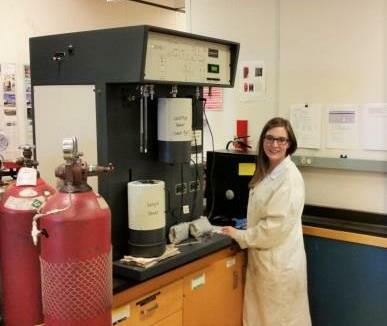 During the final year of her undergraduate degree she completed an honors thesis on the Duvernay Formation, and from there decided to pursue a graduate degree on unconventional petroleum reservoirs. She spent the summer after graduation traveling through Australia before moving to Vancouver and beginning her Masters. She is currently a student at the University of British Columbia working under the supervision of Dr. R. Marc Bustin. In her spare time Tessa enjoys hiking, biking, golfing and camping. The objective of this study is to contribute to the prediction of hydrocarbon distribution and producibility within the complex Horn River and Liard Basins using integrated modeling and petrophysical analyses. Vast resources of unconventional gas and, potentially natural gas liquids, occur within the Devonian and Mississippian strata of the Horn River and Liard Basins and Cordova embayment in northeastern British Columbia. In many areas the major technological advancements in drilling and completions that have facilitated exploitation of gas and liquid bearing shales has outpaced our understanding of the geological and engineering parameters that determine producible reserves. However, development within northeastern British Columbia is still in its’ infancy allowing for an opportunity to implement a proactive approach in the characterization of these organic-rich shales. Numerous analyses will be performed on a large suite of samples from the Exshaw, Muskwa, Otter Park, and Evie Formations to provide a comprehensive characterization of the reservoirs and elucidate important variations in petrophysical properties that may exist on a regional scale. Such information will become important calibration tools for the subsequent one and three dimensional basin models. The basin modeling will allow for characterization of the petroleum system, and predict how hydrocarbon distribution relates to petrophysical properties. This integrated approach will allow for a quantitative understanding of the petroleum system including the timing, volume, and type of hydrocarbons generated, timing and distribution of migration, and evaluation of retained hydrocarbons.